Our webshop only deliver to following countries : Belgium, The Netherlands, Luxembourg, Germany, France, Denmark, Sweden, Finland, United Kingdom, Italy, Spain, Portugal, Poland, Austria, Romania, Bulgaria, Hungary, Slovakia, Slovenia, Czech Republic, Latvia, Lithuania, Croatia, Estonia, Greece and Ireland, . For all other countries, we ask you to contact us for a special quote or to contact our local dealers. Supplement animal feed for pigeons. 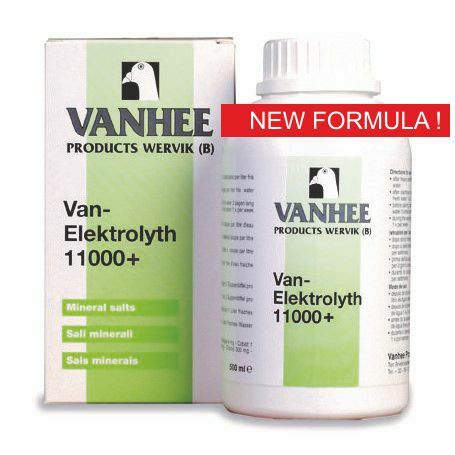 Energy solution containing electrolytes (minerals and salts) and vitamins. Stimulates the metabolism of fats and carbohydrates and controls water balance. Accelerates energy recovery after the race. Enhances the excretion of waste matters from digestion and other ingested substances. Racing pigeons returning home after the race: 2 tablespoons. Before long distance and extreme long distance races: 1 tablespoon day before basketing or on basketing day. In case of problems (e.g. watery droppings, dehydration) and after antibiotic use: 2 tablespoons for 3 days. During the breeding season and when weaning the youngsters 1 tablespoon for 3 days. Shake before use - Store in a dark and cool place. Composition: potassium chloride, sodium chloride, calcium chloride, magnesium chloride. Additives : Nutritional additives: trace elements per l : zinc (E4) (zinc sulphate, heptahydrate) 380 mg, iron (E1) (iron(II)chelate of glycine hedrate) 50 mg, copper (copper(II) sulphate, pentahydrate) 50 mg, manganese (E5) (manganese(II) sulphate, monohydrate) 40 mg, iodine (E1) (potassium iodide) 25 mg. Vitamins and provitamins per l: betaine anhydrous (3a920) 2000 mg, vitamin C (ascorbic acid) (3a300) 200 mg, vitamin B6 (pyridoxine HCL) (3a831) 75 mg, folic acid (3a316) 20 mg, vitamin B12 (cyanocobalamine) 15 mg.
Analytical constituents: Crude proteins 0 %, crude fat 0 %, crude fibre 0 %, crude ash 1,1 %, humidity 97 %, lysine 0%, methionine 0 %, calcium 0,01 %, sodium 0,35 %, potassium 0,65 %, magnesium 0,001 %, chlorine 0,9 %.